اعدام موقوف Not One More Execution! End INTERPOL collaboration with IRI now! April 4, 2010: Report on Protest at Japanese Embassy in Washington DC in Support of Jamal Saberi: Iranian Sweets and a Saberi Solidarity Cherry Tree! ESP: un modelo de carta dirigida a su presidente/Primer ministro/etc. July 22, 2010: Mostafaei: Ashtiani acquitted of murder charges. SV: Ett utrop för allmän strejk i Kurdistan!! If you don’t want VeF, then why don’t you say so? 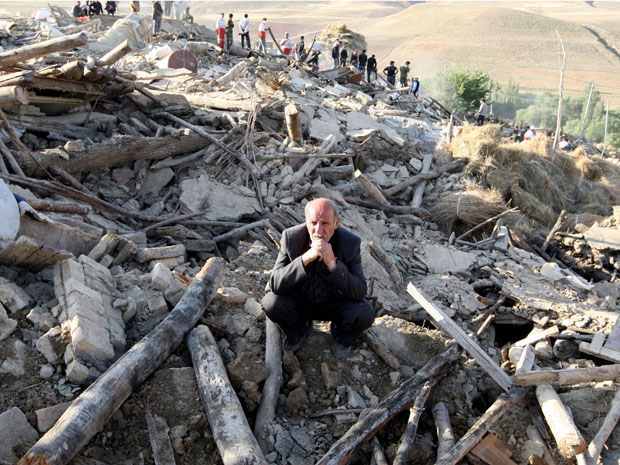 We regretfully learned that the villages and cities of northwest Iran were hit by two earthquakes of 6.3-6.4 magnitude on the Richter scale on 11 August 2012. As usual, the initial reports understated the casualties and destruction. Tragically, the death toll is rising and so far more than 300 bodies have been recovered; over 5,000 people have been injured. According to the regime’s media, a number of villages have been completely destroyed, and over one hundred villages have been heavily damaged. Reports coming from Iran indicate that there are thousands of people – children, elderly, women and men – who have either lost their homes or do not dare to leave the open fields and risk their lives in their poorly-built clay houses. Reports indicate that people are in need of shelter, warm clothes, heaters, food, and medicine. We at Mission Free Iran regret every life lost in the recent quakes. Our thoughts go out to the families of those who have perished, the injured, and those who lost their homes and livelihoods. We declare the Islamic regime the sole responsible for mobilization of resources, shelters, tents, field hospitals, food and other facilities. Iran, is located on one of the worlds most seismically active areas, and earthquakes should be expected. What should not be expected, for the same reason, is the high price that the impoverished people of Iran pay for every “natural disaster.” Earthquakes with the same magnitude as Bam and now Ahar and Varzaghan are not considered “disasters” and do not usually lead to considerable casualties and damages in Japan and the USA. One truth is that these “disasters” choose their victims from among the poorest, and therefore the consequences – the deaths, injuries, and material losses – are not “natural” at all. Man – the Islamic regime of thieves and bandits and their predecessors – are to blame. The other truth is that the Islamic thieves and pickpockets who are directly responsible for the poverty of a nation, and consequently leave the poorest to live in death traps called “traditional clay houses,” are the same ones who benefit from the misery of disaster-stricken people as a “God-given blessing” – and get the lion’s share of the aid which should be distributed among the victims, but which instead ends up in domestic and external markets like in Republic of Azerbaijan, Armenia, Turkey and central Asian countries. We call upon the people in East and West Azerbaijan and Kurdistan as well as all across Iran to organize independent rescue and relief groups. Cover the stricken villages, especially those remote and rugged areas. Use the social media to report the situation to the world. Rush to rescue and help those stricken. Demand the corrupt regime of thieves to facilitate your actions and deliver all necessary tools and equipment to the stricken villages. Peoples’ taking the initiative will force the regime to react. Be vigilant and make known that we will protest and expose all thievery and misuse of resources. « Stockholm Pride 2012: Länge leve mänskligheten! 20 June: Free Political Prisoners in Iran!